I wish I could tell you that simply swapping out curcumin or Pycnogenol for ibuprofen and Oxycontin is a viable solution for this vexing problem. Sadly, prescription pain “killers” tend to pack more of a kick – at least in acute circumstances. Still, an “all or nothing” approach isn’t mandatory. Combining conventional treatments with holistic practices can be immensely beneficial. In particular, I think it’s wise to first look at non-toxic alternatives that are unlikely to interfere with standard medical care. This type of approach can be increasingly found in clinical practices and in the medical literature. Some examples include: a) exercise as an adjuvant therapy for depression; b) meditation to reverse or slow age-related cognitive decline; c) Eye Movement Desensitization and Reprocessing or EMDR to assist with addiction recovery. Aromatherapy falls into this same category. For those who are unfamiliar, aromatherapy involves the inhalation of scented oils derived from natural sources such as flowers, leaves and seeds. When it comes to pain relief, lavender and rose oil have the largest volume of research to support their use. However, other “essential” oils and blends of oils have also shown potential. Lavender oil is most often used to ease tension and promote a restful night’s sleep, and it is effective and safe for those applications. On the pain relief front, several studies using lavender aromatherapy have been published in peer reviewed medical journals. To date, lavender oil has been shown to ease pain relating to a wide array of health conditions (dysmenorrhea or painful menstruation and renal colic) and surgical procedures (chest tube removal, coronary artery bypass grafting, peripheral cannulation and post-tonsillectomy pain). Also, it’s worth noting that in some of the trials, decreased anxiety and medication use was reported. Rose (Rosa damascene) oil shares some common attributes with lavender oil. For instance, rose aromatherapy is documented as relieving post-operative and renal colic pain intensity. In addition, rose oil has been successfully used to ease pain in burn patients during the application and removal of wound dressings. To the best of my knowledge there has been no head-to-head comparison assessing the efficacy of lavender vs. rose oil. When considering the two, you’ll probably find that rose oil is not as widely available and is considerably more expensive. For this reason, I’d try lavender first and keep rose oil as a back up. 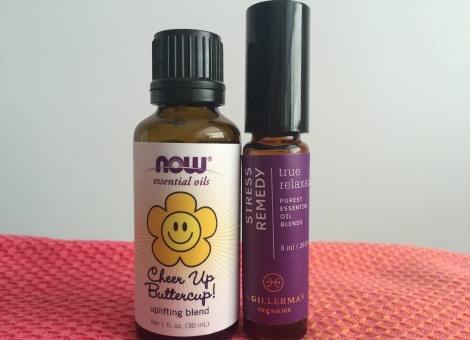 There are some other up-and-coming essential oils that may be worth trying. A study from 2014 reports that Salvia officinalis aka sage “had beneficial effects on pain relief, shortened labor stages” and had no adverse effects on the APGAR score – a measure of the health of the baby in relation to the birthing process. Another publication from 2014 determined that bitter orange (citrus auranium) aromatherapy provided a “non-aggressive method to reduce labor pain”. What’s more, a combination of bitter orange and lavender oil reduced, anxiety, depression, pain and stress in a group of seniors residing in a nursing home. These findings introduce the intriguing possibility that essential oils may work in a synergistic manner. In closing, I’d like to point out yet another upside to aromatherapy: You can bring it with you wherever you go. Simply put a few drops on a tissue or a handkerchief and take a sniff from time to time or whenever it’s needed – before a meeting or workout, while in traffic, etc. Instant aromatherapy! [Peppermint oil in the acute treatment of tension-type headache]. Tension-type headache is the most frequent form of headache. The local topical treatment with peppermint oil (oleum menthae piperitae) has proven to be significantly more effective than placebo in controlled studies. Peppermint oil targets headache pathophysiology in multiple ways. The efficacy is comparable to that of acetylsalicylic acid or paracetamol. Solutions of 10 % peppermint oil in ethanol are licensed for the treatment of tension-type headache in adults and children above 6 years. It is included in treatment recommendations and guidelines by the respective professional societies and is regarded as a standard treatment for the acute therapy of tension-type headaches. Pain Manag Nurs. 2016 Apr;17(2):140-9. Iran J Nurs Midwifery Res. 2016 Mar-Apr;21(2):197-201. Effect of lavender scent inhalation on prevention of stress, anxiety and depression in the postpartum period. BACKGROUND: Stress, anxiety, and postpartum depression are the most common problems among women in their childbearing age. Research has shown that aromatherapy administered during labor reduces anxiety in mothers. With regard to the specific biological conditions in postpartum period and the subsequent drop in hormone levels, this study investigated the effect of lavender on prevention of stress, anxiety, and postpartum depression in women. MATERIALS AND METHODS: In a clinical trial, 140 women admitted to the obstetric and gynecological unit were randomly divided into aromatherapy and non-aromatherapy groups immediately after delivery. Intervention with aromatherapy consisted of inhaling three drops of lavender essential oil every 8 h with for 4 weeks. The control group received routine care after discharge and was followed up by telephone only. After 2 weeks, 1 and 3 months of delivery, women were assessed by the 21-item Depression, Anxiety, and Stress Scale and the Edinburgh stress, anxiety, and depression scale in the two groups. Data analysis was performed by Mann-Whitney, analysis of variance (ANOVA), and post hoc tests. Level of significance was set as 0.05 for all tests. RESULTS: The results showed that the mean stress, anxiety, and depression at time point of 2 weeks (P = 0.012, P < 0.0001, and P = 0.003, respectively) and stress, anxiety, and depression scores at time points of 1 month (P < 0.0001) and 3 months after delivery (P < 0.0001) were significantly lower in the study group compared with the control group. CONCLUSIONS: Inhaling the scent of lavender for 4 weeks can prevent stress, anxiety, and depression after childbirth. J Gerontol Nurs. 2016 Jun 17:1-9. Effect of Aromatherapy Massage on Agitation and Depressive Mood in Individuals With Dementia. The current study examined the effects of aromatherapy massage on alleviating agitation and depressive mood in individuals with dementia. A randomized controlled trial and repeated measures design was conducted. A total of 59 participants were randomly assigned to intervention or control groups. The intervention group received aromatherapy massage once per week for 8 weeks. Results indicated no significant changes over time in overall agitation for either group, but agitation decreased from Week 1 to Week 5 for the intervention group. In addition, the overall depressive symptoms decreased significantly over time for the intervention group compared to the control group (p < 0.001). However, changes in agitation within 24 hours following aromatherapy massage showed some significant changes in Weeks 5 and 9. Aromatherapy massage can be an effective and safe intervention to alleviate specific agitated behaviors and depressive mood in individuals with dementia. J Evid Based Complementary Altern Med. 2016 Jun 22. The Effect of Topical Rosa damascena (Rose) Oil on Pregnancy-Related Low Back Pain: A Randomized Controlled Clinical Trial. The study aimed to assess the efficacy of topical rose oil in women with pregnancy-related low back pain. A randomized controlled clinical trial was conducted on 120 women with pregnancy-related low back pain. Patients were allocated to 3 parallel groups to receive topical rose oil (in the carrier of almond oil), placebo (carrier oil), or no intervention. All groups were followed for 4 weeks. All participants were evaluated by Visual Analog Scale and the Roland-Morris Disability Questionnaires to assess the pain intensity and its impact on daily activities before and after the intervention. Significant decrease in pain intensity compared to carrier oil or no intervention was observed. The rose oil also improves the functional ability of these patients in contrast with no intervention, while its effect on function is not significant compared to carrier oil. Rose oil reduced pregnancy-related low back pain intensity without any significant adverse effect. Complement Ther Clin Pract. 2016 Aug;24:45-9. Investigating the effect of rose essential oil in patients with primary dysmenorrhea. OBJECTIVE: This study aimed to evaluate the effects of rose essential oil on primary dysmenorrhea. METHODS: One hundred patients were randomly divided into two groups; Group D received diclofenac sodium (75 mg/im) and Group A administered diclofenac sodium with aromatherapy (2% rose essential oil). The visual analog scale (VAS) scores in all subjects at baseline, 10th min, and 30th min were recorded. RESULTS: When the two groups were compared before and after the treatment, there were significant decreases in VAS values at the 10 min and 30 min compared to baseline values in both groups (p < 0.001). However, the 30th min mean VAS value in Group D was higher than in Group A (p = 0.019). CONCLUSION: The present study suggests that aromatherapy with rose essential oil, which is a nonpharmacologic treatment method, as an adjuvant to conventional treatment methods may be beneficial for pain relief in individuals with primary dysmenorrhea. Comparing the effects of aromatherapy massage and inhalation aromatherapy on anxiety and pain in burn patients: A single-blind randomized clinical trial. BACKGROUND: Anxiety and pain are recognized as major problems of burn patients; because pharmaceutical treatments for controlling anxiety and pain symptoms lead to complications and an increase in health costs, nonpharmacological nursing interventions were considered for this group of patients. This led to the present study aimed at comparing the effect of aromatherapy massage with inhalation aromatherapy for anxiety and pain in burn patients. METHODS: This single-blind clinical trial was carried out on 90 patients with burns <20%. Patients were randomly assigned to one of three groups, namely aromatherapy massage, inhalation aromatherapy, and control group. The patients assigned to the aromatherapy massage group received a massage for half an hour using a blend of lavender and almond oils, while a blend of rose and lavender aroma was used for the inhalation aromatherapy group. Spielberger State Anxiety Inventory was used for measuring anxiety and the visual analog scale (VAS) scale was used for measuring pain. RESULTS: The results showed that three groups were equal in terms of demographics, disease characteristics, and scores of anxiety and pain at the baseline. The mean decreases of anxiety scores were -0.04±5.08, 6.33±12.55, and 6.43±10.60 in the control group, aromatherapy massage group, and inhalation group, respectively (p=0.007). The mean decrease of pain scores were -0.10±0.96, 1.70±1.84, and 0.97±1.56 in the control group, aromatherapy massage group, and inhalation group, respectively (p<0.001). CONCLUSION: The study results showed the positive effect of aromatherapy massage and inhalation aromatherapy compared with the control group in reducing both anxiety and pain of burn patients. Therefore, both interventions, which are inexpensive, and noninvasive nursing tasks can be proposed for alleviating anxiety and pain of burn patients. Complement Ther Clin Pract. 2016 Nov;25:81-86. OBJECTIVE: The aim of this study was to investigate the effect of Lavender essence inhalation on severity of labor pain and duration of labor. METHODS AND MATERIALS: This single-blind, randomized clinical trial was conducted on 120 pregnant women in two groups. The experimental group received 2 drops of Lavender essence inhaled at three stages (4-5, 6-7, 8-9 cm cervical dilation) and severity of the labor pain and duration of labor was measured before and after intervention. The control group was treated with distilled water as a placebo in the similar ways, too. RESULTS: The results showed that difference in the labor pain before and after intervention in two groups was significant (P = 0/001). But there was no difference in mean duration of the active phase and the second stage of labor between the two groups. CONCLUSION: Lavender essence aromatherapy may be an effective therapeutic option for pain management for women in labor. Complement Ther Clin Pract. 2016 Nov;25:75-80. Effect of aromatherapy massage with lavender essential oil on pain in patients with osteoarthritis of the knee: A randomized controlled clinical trial. BACKGROUND: Osteoarthritis of the knee is the most common chronic joint disease that involves middle aged and elderly people. The purpose of this study was to investigate the effect of aromatherapy massage with lavender essential oil on pain in patients with osteoarthritis of the knee. METHODS: In this single-blinded, randomized clinical trial, 90 patients with osteoarthritis of the knee who referred to the outpatient rheumatology clinics affiliated with Birjand University of Medical Sciences were selected through convenience sampling method. They were randomly assigned to three groups: intervention (aromatherapy massage with lavender essential oil), placebo (massage with almond oil) and control (without massage). The patients were evaluated at baseline, immediately after the intervention, 1 week, and 4 weeks after the intervention in terms of pain via visual analogue scale. The data were analyzed in SPSS (version 16) using the repeated measure ANOVA, one-way ANOVA, and chi-squared test. RESULTS: Pain severity of the patients in the intervention group was significantly different immediately and 1 week after the intervention compared with their initial status (p < 0.001) and that of the control group (p < 0.001 and p = 0.009 respectively). However, at the third phase of follow-up (i.e., 4 weeks after the intervention), there was no significant difference between the groups according to the visual analogue scale (p = 0.67). CONCLUSION: Aromatherapy massage with lavender essential oil was found effective in relieving pain in patients with knee osteoarthritis. However, further studies are needed to confirm findings of this study. The Effectiveness of Aromatherapy in Reducing Pain: A Systematic Review and Meta-Analysis. Background. Aromatherapy refers to the medicinal or therapeutic use of essential oils absorbed through the skin or olfactory system. Recent literature has examined the effectiveness of aromatherapy in treating pain. Methods. 12 studies examining the use of aromatherapy for pain management were identified through an electronic database search. A meta-analysis was performed to determine the effects of aromatherapy on pain. Results. There is a significant positive effect of aromatherapy (compared to placebo or treatments as usual controls) in reducing pain reported on a visual analog scale (SMD = -1.18, 95% CI: -1.33, -1.03; p < 0.0001). Secondary analyses found that aromatherapy is more consistent for treating nociceptive (SMD = -1.57, 95% CI: -1.76, -1.39, p < 0.0001) and acute pain (SMD = -1.58, 95% CI: -1.75, -1.40, p < 0.0001) than inflammatory (SMD = -0.53, 95% CI: -0.77, -0.29, p < 0.0001) and chronic pain (SMD = -0.22, 95% CI: -0.49, 0.05, p = 0.001), respectively. Based on the available research, aromatherapy is most effective in treating postoperative pain (SMD = -1.79, 95% CI: -2.08, -1.51, p < 0.0001) and obstetrical and gynecological pain (SMD = -1.14, 95% CI: -2.10, -0.19, p < 0.0001). Conclusion. The findings of this study indicate that aromatherapy can successfully treat pain when combined with conventional treatments. Ann Med Health Sci Res. 2016 Jul-Aug;6(4):211-215. 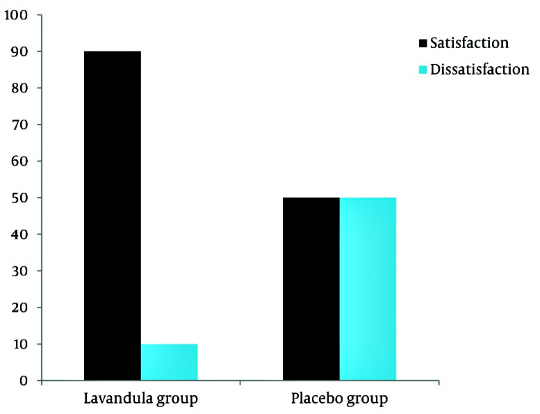 The Effect of Lavender Aromatherapy on the Pain Severity of Primary Dysmenorrhea: A Triple-blind Randomized Clinical Trial. BACKGROUND: Primary dysmenorrhea is the most common complaint in adolescents and adult young women that disturbs their daily life performance. AIM: The current study investigated the effect of lavender aromatherapy on pain severity in primary dysmenorrhea. SUBJECTS AND METHODS: This triple-blind randomized clinical trial was conducted on 200 students of Ardabil University of Medical Sciences, Iran. Subjects were allocated randomly into intervention (lavender) and control (placebo) groups. The researcher assistant asked the participants to smell the lavender in the first 3 days of menstruation, 30 min in a day in two menstrual cycles. Control group was also administered placebo (diluted milk) to be used as lavender in treatment group. Pain severity was scored by visual analog scale in the first 3 days of menstruation before intervention and 2 months after intervention. Data were analyzed through descriptive statistics and independent and paired samples t-tests. RESULTS: There was a significant difference in average pain severity between treatment and control groups after intervention. However, students in the treatment group reported significantly less pain severity 2 months after intervention (P < 0.01). CONCLUSION: Using lavender aromatherapy for 2 months may be effective in decreasing the pain severity of primary dysmenorrhea. Int J Prev Med. 2017 May 4;8:29. Effect of Lavender Oil Aroma in the Early Hours of Postpartum Period on Maternal Pains, Fatigue, and Mood: A Randomized Clinical Trial. BACKGROUND: Busy care providers focus on the serious complications of postpartum period. This issue causes the seemingly trivial complications, such as mother’s pains, fatigue, and psychological status, to be less taken into account. The study aimed to determine the effect of lavender oil aroma in the early hours of postpartum period on maternal pains, fatigue, and mood in primiparous mothers. METHODS: This randomized clinical trial was conducted on 56 participants; 29 in intervention group and 27 in control group. The intervention group received lavender oil in three doses during the first 24 h after delivery. Sesame oil was used in the control group. Intensity of pain, fatigue, and distress level was measured by visual analog scale before and after the interventions. Besides, mood status was assessed through the positive and negative affect schedule. RESULTS: The mean age of all the participants was 23.88 ± 3.88 years. After the first intervention and also in the tomorrow morning assessment, significant differences were found between the two groups regarding perineal pain (P = 0.004, P < 0.001), physical pain (P < 0.001), fatigue (P = 0.02, P < 0.001), and distress scores (P < 0.001). In addition, significant differences were found concerning the mean scores of positive (P < 0.001) and negative (P = 0.007, P < 0.001) moods between the two groups after the interventions. Repeated measures analyses showed that the two groups were significantly different over time in all the evaluated variables. CONCLUSIONS: Lavender oil aromatherapy starting in the first hours of postpartum period resulted in better physical and mood status compared to nonaromatic group.